Three Ugandan soldiers from the African Union force in Somalia have been sentenced to two years in prison for injuring civilians in two shooting incidents in the capital, Mogadishu. Some Somalis have previously accused the AU force - Amisom - of using indiscriminate violence but these are the first such convictions. The AU force is helping the UN-backed government tackle Islamist militias. 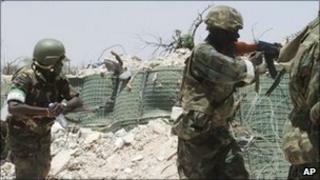 At least 14 people were killed in fierce fighting late on Tuesday. The two AU soldiers have been sent home to Uganda to serve their sentences. Amisom commander Maj Gen Nathan Mugisha said the jail terms illustrated that "any acts of carelessness and irresponsibility will not be condoned or tolerated". He said the incidents in November 2010 and January 2011 were regrettable. Amisom said that no civilians died in the incidents but admitted that some Mogadishu residents were wounded. In the latest fighting, Mogadishu residents reported hearing heavy shelling through the night around the main market area of the beleaguered city. There have been renewed efforts by the government forces since the beginning of the year to gain control of major parts of Mogadishu. This offensive is expected to be intensified with the recent arrival of an additional 1,000 AU troops to bolster the 8,000 already there. The al-Shabab Islamist militants, linked to al-Qaeda, control much of southern and central Somalia. The country has not had an effective government for two decades.